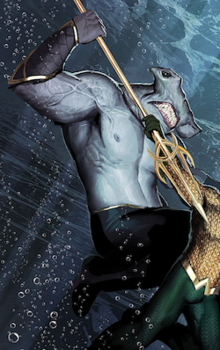 King Shark on the cover of Aquaman: Sword of Atlantis #47 (Jan. 2007). Art by Jackson Guice and Daniel Brown. King Shark (Nanaue) is a fictional supervillain appearing in comic books published by DC Comics. The character was created by Karl Kesel and made a brief cameo in Superboy vol. 3, #0 (Oct. 1994) before making his first full appearance in Superboy vol. 3, #9 (Nov. 1994). King Shark appears on the Arrowverse television series The Flash with Dan Payne portraying the character in its human form, while David Hayter voices the CGI shark form. Born in Hawaii, Nanaue is a humanoid shark. His father is "The King of All Sharks"—also known as the Shark God. Originally there were some doubts surrounding his origins, as other characters, such as special agent Sam Makoa, dismissed his origins as superstition and referred to Nanaue as a "savage mutation" and it was also implied that he was one of the "Wild Men", evolved animals based on those in Kamandi: The Last Boy on Earth, but the now-ended Aquaman: Sword of Atlantis series put an end to the controversy by firmly establishing him as the Shark God's son. King Shark was responsible for a number of missing persons several years before Superboy arrived in Hawaii. Sam Makoa was responsible for bringing him in and bore the scars to prove it. King Shark is freed by the Silicon Dragons who plan on hiring him. Nanaue is not interested and kills his liberators before heading to his mother's house. His mother allows him to bite her arm off to feed. Superboy managed to take him down with his heat vision. When Superboy and Makoa were assigned to the Suicide Squad to destroy the Silicon Dragons, King Shark was forced to help. An explosive belt was strapped to his waist, set to detonate if anything happened to Makoa. Other members of the Squad included Knockout and Squad veterans Deadshot and Captain Boomerang. Nanuae was a crazed fighting machine, shredding legions of the Dragons (and killing Sidearm too, when he betrays the team). Despite the belt detonating, King Shark survived the blast and the destruction of the lair. After a research team sent to investigate the lair's remains went missing, King Shark was initially suspected, but it turned out to be Black Manta. King Shark fought Superboy, but he was defeated and driven out to sea. King Shark later turned up in the Wild Lands and fought Superboy and his allies. After a fierce battle, he was assumed killed, but no body was ever recovered. He joined Manchester Black's Legion of Villains in the "Ending Battle". He later turned up in Metropolis and attacked Jimmy Olsen. Superman quickly took him down, knocking most of his teeth out (though they grew back). In all of his previous appearances he rarely spoke, but during this issue he was very verbose (although that may be because of Black's influence). He also was smaller and a long way from the water. King Shark also made an appearance during the Joker's Last Laugh riot with Orca. King Shark is recruited into Alexander Luthor's Secret Society of Super Villains and is one of the many sent to attack Sub Diego. During the battle he kills Neptune Perkins. "The currents of destiny bend and twist around that young man. For good or ill, he will shape the coming oceanscape. You will protect him. You will be my agent in his camp. Close enough to guard against others who seek to control him. And close enough, when I decide the time is ripe... ... to strike, and kill him without warning". "When thorned crown lies shattered, she comes. Born of coral, of life-in-death, of long prayer. Shake the sea floor with her power, shall she, shake the destiny of all beneath the waves..."
The Shark God believed that if the Order was destroyed, that would trigger the prophecy, birthing some great power in the process. However, King Shark was defeated by Aquaman before completing his father's goal. He then was imprisoned by priests of the Thorny Crown for three years before escaping; Nanaue mentions that he was tortured during his captivity. Following the Final Crisis, King Shark's jaw is broken after being cleaved wide open and later his left arm is ripped off his body during battle, but later grew back. King Shark is among Superboy's villains brought by Krypto to a hill near the Smallville high school. However, he is either unconscious or stunned at the time. Most recently, he has joined the Secret Six as a brawler. His tenure with the Six proves to be short-lived, as the team is soon captured by a large group of superheroes during a failed mission in Gotham City. King Shark manages to briefly overpower his old foe Superboy during the battle, but is ultimately pummeled into unconsciousness by Supergirl. King Shark on the cover of Aquaman vol. 8, #32 (March 2018). Art by Stjepan Šejić. In September 2011, The New 52 rebooted DC's continuity. In this new timeline, King Shark now resembles a humanoid hammerhead shark. He was tortured and forced into the Suicide Squad by Amanda Waller. When it came to the Suicide Squad having to comply with Amanda Waller's demands, King Shark ended up eating his teammate Yo-Yo (it is later revealed that Yo-Yo survived). During the Forever Evil storyline, King Shark is among the villains that the Crime Syndicate recruited to join the Secret Society of Super Villains. DC Comics ended the Rebirth branding in December 2017, opting to include everything under a larger "DC Universe" banner and naming. The continuity established by Rebirth continues into DC Universe. King Shark also appears in Teen Titans where he kidnaps a reporter and plans to overthrow the surface dwellers, but is foiled by Jackson Hyde and Damian Wayne. It is later revealed that he was working under Black Manta. King Shark's augmented flesh provides protection against the pressures of the deep and physical attacks. His shark-like physiology includes teeth and claws, which are used as weapons, and gills that allow him to breathe underwater. He can swim at great speeds and is resistant to cold. King Shark has enhanced strength and endurance, and he can also regenerate lost bodily tissue. In the alternate timeline of the Flashpoint event, King Shark works as a strongman freak show in the Haley's Circus. Haley's Circus is attacked by Amazons, and King Shark is killed while trying to save Doctor Fate. King Shark appears in The Flash, portrayed by Dan Payne as a human and voiced by David Hayter as King Shark. This version is originally Shay Lamden, a marine biologist on Earth-2 who is transformed by the S.T.A.R. Labs particle accelerator (while his Earth-1 counterpart just develops massive tumors after his S.T.A.R. Labs' accelerator explosion and dies shortly afterwards). In the episode "The Fury of Firestorm", he falls under Zoom's control and gets sent to Earth-1 to kill the Flash, who gets saved by Patty Spivot, who subsequently dubs him 'King Shark'. The character returns in the episode "King Shark", where he escapes from A.R.G.U.S. imprisonment and goes after the Flash to take him to Zoom once more, but is ultimately defeated when the Flash incapacitates him by electrifying the water he swims in. King Shark is returned to A.R.G.U.S., where Lyla Michaels vows to find a cure for him rather than exploit his capabilities. In the episode "Cause and Effect", King Shark is seen at A.R.G.U.S. acting as a watchdog for alien technology. In the subsequent episode "Infantino Street", the Flash and Captain Cold break into A.R.G.U.S to steal the technology and briefly battle King Shark, putting him to 'sleep' for a time by cooling the temperature of the room he is in. Although King Shark loses an arm in the battle when Captain Cold and Flash close the cell's door on it, he quickly regenerates it. In "Crisis on Earth X, Part 1", King Shark is shown having somehow escaped from A.R.G.U.S. and battling the Flash before being knocked out by him. In the episode "King Shark vs. Gorilla Grodd", Earth-1 Lamden's wife, Tanya (who is also a marine biologist), has been recruited by A.R.G.U.S. to work with King Shark; developing a "telepathy crown" to talk with him and help him maintain his humanity. When Team Flash approaches them to test their newly developed metahuman cure, King Shark goes on a rampage as a result of Gorilla Grodd's attempt to control him, though Lamden is able to resist due to his animalistic brain. He nearly kills Vibe before Flash forcibly gives him the cure and returns him to his human form. However, small traces of dark matter remain in his body and he is susceptible to minor transformations back into his shark form, requiring a second dose to fully cure him. When Grodd steals the telepathy crown to enslave Central City and incapacitates Flash and XS, Lamden voluntarily sacrifices his human form to turn back into King Shark and stop Grodd in order to atone for all of his criminal misdeeds; even in spite of the possibility that he would never be able to return to his human form again. After a climatic battle, King Shark is able to stop Grodd and remove the telepathy crown. He is transferred to an aquarium, where Tanya watches over him; using the telepathy crown to communicate with each other once more. King Shark appears in the web series DC Super Hero Girls, voiced by Kevin Michael Richardson. King Shark appears in Superman/Batman: Public Enemies. He is among the supervillains that attack Batman and Superman. King Shark appears in Batman: Assault on Arkham, voiced by John DiMaggio. In the film, King Shark is recruited by Amanda Waller to be a member of the Suicide Squad and given them the mission of killing the Riddler. King Shark appears to be a very large human with mutated features, a metal mask that augments his biting ability and a red Mohawk for a dorsal fin. He seems to have formed a relationship with Killer Frost. He is also shown to have a strong fear of heights. During the mission, King Shark is killed by the bomb that Waller put on his neck when Riddler was trying to disable the bombs of the Suicide Squad. Riddler attributed King Shark's tough skin as to why the bomb wasn't stopped. Suicide Squad director David Ayer revealed in a Q&A on Twitter that King Shark was originally going to appear in the film, but would only have been possible as a fully CGI character. His replacement Killer Croc was portrayed practically with makeup and prosthetics. King Shark will appear in the upcoming film The Suicide Squad as the newest member. King Shark appears in Lego Batman 3: Beyond Gotham, voiced by Travis Willingham. He resembles the hammerhead shark version seen in The New 52 and is part of "The Squad" downloadable content. King Shark appears as a playable character in Lego DC Super-Villains, voiced by Fred Tatasciore. King Shark appears in the episode "Atlantis" of DC Universe Online, voiced by Dale Dudley. In the Batman: Arkham Knight prequel comic, King Shark didn't appear, but his son "Kid Shark" makes an appearance. Kid Shark attacked Batman on the street. Commissioner Gordon happened to be in the area and joined in the fight, providing enough of a distraction for Batman to brain the kid in the back of the head with a fire hydrant. The Gotham City Police Department picked him up shortly afterwards. King Shark appears in issue #14 of the Young Justice tie-in comic book. King Shark is known in this franchise as King Nanaue Sha'ark. He is shown as a student at the same Atlantean sorcery academy that Aqualad once attended. King Sha'ark is also the ruler of the Atlantean city-state Nanauve. Sha'ark has the habit of referring to those he considers weaker than himself as "chum". In issue #15, Lori Lemaris and Topo had to convince Sha'ark not to eat the former Atlantean Purist Ronal (who was pardoned by Aquaman). He appears in The Flash: Season Zero tie-in comic, where Shay Lamden is diagnosed with being in the fourth stage of his illness and has little chance for survival, but Dr. Shults offered to use shark cells to regenerate his dying body cells, which Lamden agreed to. During the procedure, the particle accelerator exploded, mutating him into a humanoid shark. A year later, he went after the scientists involved in the procedure. When going after one of them, Cisco Ramon intervened, leading to the Flash to show up, but King Shark severely injured Flash, forcing him and Cisco to retreat. While visiting his family's old apartment, he was cornered by the Suicide Squad and attacked by Deadshot, Cupid, and Captain Boomerang. The Flash intervened and tried to save King Shark, but he was eventually captured by the Squad, where they took him back to A.R.G.U.S. to be tortured by Amanda Waller into joining the Suicide Squad. He later joined the Squad in taking down a terrorist named Hart, but when King Shark is about to eat him, Flash arrived and saved Hart, unaware he was a terrorist. Once the Squad told him about their mission, Deadshot sedated Flash as they went after Hart. After defeating Hart and defusing his bombs, Flash offered to take King Shark back to the pipeline until they find a cure, but King Shark chooses to stay with the Squad, due to Waller injecting him with a poison only she has the cure to, and felt he belonged with the Squad and promised to try harder to not eat people. After the events of the second season, this version of the character was later established as non-canon. ^ David Ayer [@DavidAyerMovies] (29 July 2016). ". @diablosantanas #askthesquad" (Tweet) – via Twitter. ^ Sneider, Jeff (March 7, 2019). "'Suicide Squad 2' Exclusive: Meet the New Characters James Gunn Will Introduce in Sequel". Collider. Retrieved March 7, 2019. ^ "New Episode: ATLANTIS!". DC Universe Online. November 8, 2018. Retrieved November 13, 2018. ^ Dudley, Dale (November 13, 2018). "Want to thank all the great people at DC..." Facebook. Retrieved November 13, 2018. This page was last edited on 19 April 2019, at 05:11 (UTC).